Welcome emails are just wonderful, aren't they? A brilliant opportunity to activate leads into first-time purchasers; tell your brand's fascinating story; show-off your key selling points; illustrate your product range; promote your awesome social media channels; set subscriber expectations...(and breathe!). But do you know what would be even more wonderful? If we could bestow you with an Ometrian engraved magic wand that would guarantee your brand's welcome emails are actually opened, read, engaged with and - most importantly - acted upon. Unfortunately, there is no magic wand. Why? Because no one brand is the same, and no customer base is, either. Ultimately, different subscribers will respond in different ways to the emails you send. Instead, it all boils down to good old trial and error. Listed below is a handful of ingenious tests you can run on your welcome series, to find out what works best for you and set about converting all those "subscribers" into "customers". Just to recap, A/B testing - also called split testing - is the sending out of two different email campaigns (to different groups of recipients) in order to figure out which is the more successful in terms of engagement. You can A/B test your welcome series with plenty of different things. A good example of this is whether you should send a single welcome email or a series of several. We often refer to the welcome experience as being a “series”, however this doesn’t have to be the case. It may be that your subscribers would get annoyed should you send them multiple emails over a short time period, or it could be that they would forget about your brand should you only send one email as soon as they subscribe. There’s only one way to find out! Try both. If you do choose to run a series, it’s also worth experimenting with the number of emails you send. For example: should you send three emails in one week, or two emails over two weeks? How do engagement metrics like open and click rates vary? Perhaps most importantly, how much revenue do they generate? (I'm going to put a cheeky plug in here for Ometria, which enables you to split test and monitor these metrics). If you do opt for a series of emails, it’s worth thinking about the story you want to tell using those messages. Each email should tell a different message, but in the same style, to make your brand recognisable and informative. 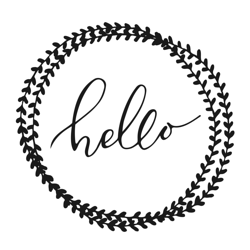 For more hints and tips about creating a great welcome series, check out our ultimate welcome series cheat sheet, which includes a best practice checklist, as well as some great examples. Subject lines are another aspect of your welcome emails you can optimise with A/B testing, as well as email content, images and other individual aspects of each email. Your very first welcome message to new subscribers is likely to be triggered the moment they hit the 'subscribe' button. But what about the rest of the emails in your series? What time should you send those? Unless your brand chooses to use send time optimisation (provided by some ESPs) it’s worth investigating the best time to send these remaining emails. For example: are your subscribers more inclined to check their email first thing in the morning or during their post-lunch lull? We recommend sending your emails shortly before your brand's website receives the most traffic during the day. On top of engagement rate, a good way of telling if your efforts have paid off is by looking at the average time it takes a subscriber (or lead) to become a first-time customer (we call this lead activation rate). If you track this for different cohorts of customers who subscribe, you can tell whether your efforts are having an impact on reducing your customer activation rate. To recap, customer segmentation - also known as marketing segmentation - is the “process of using customer data to enable a clustering of customers with shared attributes so that communication can be customised to say different things in different ways”. Make sense? Considering talk about making the customer experience more personal has grown massively over the past couple of years, you’re probably well aware by now that tailored content leads to higher conversion rates. As it’s a welcome series, the information you’ll have about your subscriber is the likely to be limited to what you’ve gleaned about them from the sign-up process (though if you have a single customer view you may be able to backdate any browsing behaviour too). Try segmenting your welcome series according to the above categories. It should have a big impact on your engagement levels, making new subscribers feel more welcome and at home with your brand. You might find that certain segmentation has a bigger impact than others. Trying to cram all of these messages into a single email is likely to result in a case of choice paralysis for the recipient. If you have multiple actions that you'd like new subscribers to take, consider splitting them between a number of emails and measuring to see whether engagement increases. 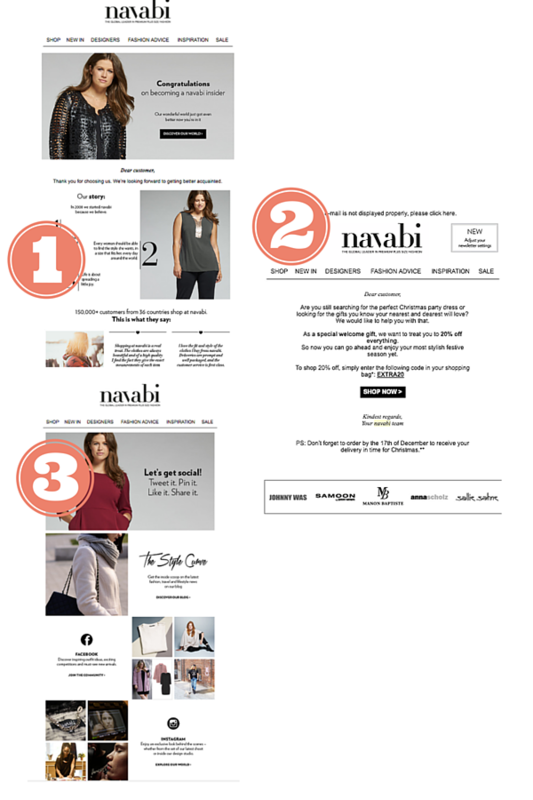 For instance, below navabi has a clear objective for each email in its welcome series. The first is all about conveying brand values and social proof. The second encourages customers to make a first purchase with a cheeky incentive. The next encourages recipients to follow the brand on social. As the old proverb goes: "You never know what you(r brand) can do till you try." When it comes to optimising your welcome series, the only way you'll find out what works is by trying out different things. It takes time, but there is no shortcut to creating the ultimate welcome series (not for us muggles, anyway). We hope the above tests help you on your way to creating long-term brand engagement with your subscribers. Any ideas or thoughts? Tweet us @OmetriaData.